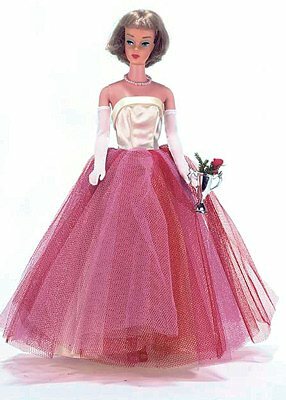 This dress is identical to Senior Prom #951 (1963-1964) - only the colors are different. This one is much harder to find. It was only made for one year and the white satin bodice is very prone to show wear and soiling. The strapless gown has snap closures in the back. The tulle can flatten after all the years, but it is easy to fluff it back up by holding the dress upside down and separating the layers. The rose bouquet and trophy are very hard to find. 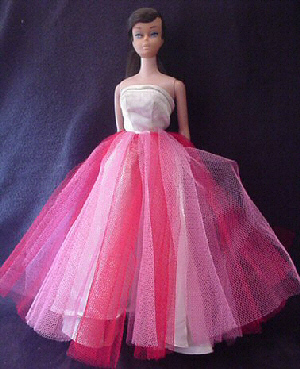 Mattel released a Campus Sweetheart Vintage Barbie Reproduction in 2008.